Poor Indoor Air Quality, Mold Exposure, and Upper Respiratory Tract Infections—Are We Placing Our Children at Risk? Understanding how respiratory health risks are associated with poor housing is essential to designing effective strategies to improve children’s quality of life. The objective of the study described in this article was to determine the relationship between respiratory health and housing conditions. A survey was completed by 3,424 parents of children in third and fourth grade in Winnipeg, Manitoba, Canada. An engineering audit and air samples were also taken in the homes of a subset of 715 homes. Results showed that a child’s respiratory health is significantly associated with self-reported visible mold in the home and that a significant association existed between occupant-reported visible mold and tested airborne mold. Findings highlight the need for clearer standards of acceptable CFU/m3 limits for mold genera that are applicable to homes. In the absence of such guidelines, problems associated with indoor mold will continue to impact the health of residents, despite growing evidence of the adverse effects from mold exposure. Exposure to radon continues to be a leading cause of lung cancer despite the availability of effective testing and mitigation options. This study examined differences in beliefs about radon testing among radon testers (n = 110) and a comparison sample of residents (n = 198) in Utah County, Utah, which is a high radon area. Structural equation modeling was used to analyze relationships between radon testing status and self-efficacy, knowledge, behavioral modeling, and risk perception. Risk perception (0.20, p < .04), self-efficacy (0.30, p < .01), and knowledge (0.40, p < .001) were positively associated with testing. Behavioral modeling was indirectly associated with testing through intervening pathways of self-efficacy (z = 1.97, p < .05) and knowledge (z = 2.57, p = .01). The results imply that increasing radon knowledge and self-efficacy, along with traditional intervention efforts focusing on risk perception, might be important factors to increase radon testing in residential areas. A study examining the relationship between housing conditions, respiratory health, and school absenteeism was conducted in the city of Winnipeg in Manitoba, Canada. As part of this study, a survey was completed by 3,424 parents of children in grades 3 and 4 to determine the a) relationship between self-reported visible mold in homes and tested airborne mold; b) relationships of self-reported visible mold, tested airborne mold, and asthma and/or persistent colds; c) school absenteeism rates due to asthma and/or persistent colds; and d) children’s socioeconomic status (SES) and incidence of asthma and/or persistent colds. In addition, a complete inspection of a subset of 715 homes was conducted, including the collection of over 1,400 indoor and 500 outdoor air samples for mold analysis. Results indicate a significant association between self-reported visible mold and airborne mold. Additionally, a significant association was found between Cladosporium levels from air samples (the most common genus type found) and children’s asthma in combination with persistent colds. Children with persistent colds in combination with asthma miss significantly more school than children who have only asthma or only persistent colds. Children from poorer families reported more persistent colds than children from high-income families. No association was found between income and asthma. Furthermore, SES was not a significant factor for number of school days missed. The number of children in daycare centers (DCCs) is rising. This increases exposure to microorganisms and infectious diseases. Little is known about which bacteria and viruses are present in the DCC environment and where they are located. In the study described in this article, the authors set out to determine the prevalence of pathogenic bacteria and viruses and to find the most contaminated fomites in DCCs. Fifteen locations in each DCC were sampled for bacteria, respiratory viruses, and gastrointestinal viruses. The locations were in the toilet, kitchen, and playroom areas and included nursery pillows, toys, and tables, among other things. Coliform bacteria were primarily found in the toilet and kitchen areas whereas nasopharyngeal bacteria were found mostly on toys and fabric surfaces in the playroom. Respiratory viruses were omnipresent in the DCC environment, especially on the toys. The American Healthy Homes Survey, June 2005—March 2006, measured levels of lead and arsenic in homes nationwide. Based on a three-stage cluster sample of 1,131 housing units, key statistically weighted estimates of the prevalence of lead-based paint (LBP) and LBP hazards associated with paint, dust, and soil, and arsenic in dust and soil, were as follows: 37.1 million homes (35%) had some LBP; 23.2 million (22%) had one or more LBP hazards; 93% of the homes with LBP were built before 1978. The highest prevalence of LBP and LBP hazards was in the Northeast and Midwest. Over three million homes with children under six years of age had LBP hazards, including 1.1 million low-income households (<$30,000/yr.). Less than 5% of homes had detectable levels of arsenic in dust (≥5 μg/ft2). Arsenic in soil (for homes with yard soil) averaged 6.6 parts per million (ppm). Many homes had soil arsenic levels of 20 ppm or greater, including 16% of homes with wooden structures in the yard and 8% of homes without such structures. Recent research suggests that the resurgence of bed bugs in the U.S. has occurred at an alarming rate. Assumptions have been made that socioeconomic status is not associated with the prevalence of bed bug infestations. Little information is available at the local level, however, about the prevalence of bed bugs in private homes. The authors’ pilot study aimed to identify prevalence, knowledge, and concern about bed bugs in one higher income village in Ohio utilizing survey methodology. Responses from 96 individuals who completed the Prevalence, Knowledge, and Concern About Bed Bugs survey were utilized for analysis. The majority of the sample respondents were white and 95% reported that they owned their residence. Only 6% knew someone with bed bugs. Additionally, 52% reported they were somewhat concerned about bed bugs. About 46% reported that they had changed their behavior. For a higher income area, the prevalence was dissimilar to the rate reported in the general public (about 20%). This suggests that bed bugs may be an environmental issue effecting low-income populations disproportionately. Further research is needed in areas of differing socioeconomic levels. For any foodservice operation to manage its risk effectively, managers must learn basic food safety principles and apply that information on the job every day. 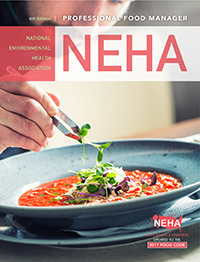 NEHA's Professional Food Manager, Sixth Edition, supplies food, beverage, culinary, and hospitality employees with the knowledge needed to ensure food safety in the workplace. This book provides information on topics such as the principles of food safety management and how to use those principles to create a food safety culture. The Professional Food Manager, Sixth Edition is updated to the 2017 FDA Food Code. Aligns with American Culinary Federation Education Foundation competencies. Prepares candidates for CFP-approved food manager exams (e.g., Prometric, National Registry, ServSafe, etc.). Copyright © by National Environmental Health Association, Incorporated. All rights reserved.